Taiwan’s Coast Guard and Military held a simulated fire drill and patrolled in the East China Sea last week, even as Taiwan’s President continued to promote his East China Sea peace initiative. According to detailed press accounts in Taiwan’s media this week, last week Taiwan’s Coast Guard, Navy, and Air Force conducted combined patrols and drills in areas of the East China Sea from February 17th through February 19th. 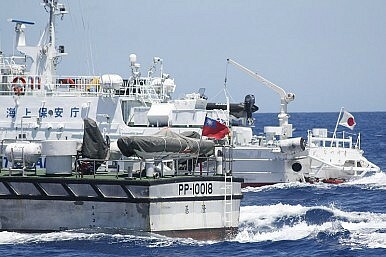 The drills and patrols took place within Taiwan’s “provisional law enforcement boundary,” which covers all waters stretching 270 nautical miles off of the island’s northern trip. These waters also overlap with both China and Japan’s Air Defense Identification Zones (ADIZs). China’s Chunxiao gas field also falls within Taiwan’s provisional law enforcement boundary. The local press reports said the drills showed that Taiwan would not be beholden to the ADIZ that China announced in the East China Sea last November. The media reports said that the two-day exercise began with two Coast Guard patrol vessels, the Hsin Bei and the Ho-shin, and the Navy’s Kang Ding frigate conducting simulated firings of 20-mm and 40-mm guns near Pengchia Islet, about 30 nm from Taiwan’s most northern tip. They were joined there by an Air Force S-70C helicopter, and later an S-2T anti-submarine aircraft and two F-16 fighter jets joined the Coast Guard and Naval vessels as they headed further north. Around 130 nm out from Taiwan’s northern-most tip, the Kang Ding and another Naval frigate broke off from the convoy and stood guard there while the two Coast Guard vessels continued north to conduct patrols and protect Taiwanese fishing boats. In the early morning of February 18, as the Coast Guard vessels came upon the Chunxiao gas fields at the outermost reach of Taiwan’s provisional law enforcement boundary, they came upon a Japan Coast Guard (JCG) patrol vessel, the 1,000-ton PL-120 Kurisaki. One of the Taiwanese Cost Guard vessels came within a half nm from the Kurisaki, and there was what the media account said was a “tense moment,” before the Japanese Coast Guard vessel sailed away. Just minutes later, as the two Coast Guard vessels “conducted a series of checks and patrols around wellheads in the Chunxiao gas field,” they drew the attention of Chinese “Hai Yang Shi You 603” tug and supply ship. The Chinese vessel made radio contact with one of the Taiwan Coast Guard vessels, which explained that they were conducting a mission to protect Taiwan’s fishermen in the area. There doesn’t appear to have been much of a protest from the Chinese, and two vessels began journeying back south towards Taiwan. Before they had reached the two Naval frigates still on standby, however, Tokyo sent “several SH-60K choppers and P-3C surveillance aircraft” to monitor the two Taiwanese Coast Guard vessels. They later flew away, the reports said. The two Coast Guard vessels were then escorted back to Taiwan by the Navy frigates, with the convoy arriving at the Keelung port in northeastern Taiwan in the early morning hours of February 19. The fact that the patrol and drill took place at all, and especially that a play-by-play account of it was given to the Taiwanese press, suggests that Taipei seeks to make it known that it defying China’s East China Sea ADIZ. There have been similar accounts of the U.S., Japan and South Korean militaries and coast guards acting in defiance of China’s East China Sea ADIZ. China, which has been seeking common cause with Taiwan over sovereignty claims in the East and South China Sea, does not appear to have acknowledged the Taiwanese Coast Guard patrols in its English-language press.